H.G. Wells: What... have... I... done? I've turned that bloody maniac loose upon Utopia! Q: Please explain the purpose of the key? Q: What is 'Time After Time' about? 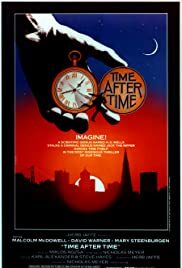 Q: Is 'Time After Time' based on a book? "My friends call me Jack." through time and some romance on the side. It's balanced out by some witty humour and a cerebrally literate script - that compares these two men's visions of the future --- one expecting a Utopia and the other believing man will never change. An Imaginative, if old-fashion Sci-fi trip. "You astonish me HG. The future will prove you wrong."